After a couple months of searching, we FINALLY found a new place to live within the city of Vladivostok. We wanted to be near to both of our jobs, and be in proximity to at least a few stores. Neither of us owned a car, so when we found an apartment flat near the city's trolly network it seemed like the best of both worlds. The building was brand new, one of the high-rise apartment blocks under construction all over the city. As we were touring with the building manager, he took us through several flat layout options, including one bedroom, two bedroom, etc. There was no paint on the walls yet, just Sheetrock with the random spatter of plaster covering screw holes here or there. We found a corner unit on the 10th floor, with a view of a nearby park, and we completed all the necessary paperwork. Now, we just had to work out the move-in schedule and wait for the apartment to be finished. I ended up staying in the city mid-week, at the same tiny hotel where we had been staying following our last move-out. Ludya spent much of her time at Babushka's dacha in the country, taking the 45 minute train ride back and forth to her job. On the weekends we'd meet up there and spend time together. It wasn't ideal, but it was temporary and we were making it work. The short fall-season had come to a close and winter was already settling harshly across the coastline. Daytime temperatures dropped from a comfortable 15 C during the days to about 5, and it froze every night. We started to make plans for the long, complicated "winter holidays" which are so uniquely Russian. The first of these being the "feast of Saint Nicholas" in early December. If I had to relate it to any American holiday I'd say it's probably like Thanksgiving. Mostly revolving around a large family meal. As the snows began to blanket the Primorsky territory, Ludya and I spent more and more time exploring the area around Babushka's village. The forest was absolutely breathtaking covered in snow, like something from a fairytale. Massive groves of pine, deep greens mixed with sharp white snow. Picturesque icy ponds with random deer or red foxes wandering about as they've done since life evolved in that ancient place. One of the places both Ludya and I wanted to visit was the "Dead Village" which several villagers had told us about. No one could remember the "official" name of the town, and it had been abandoned since about 1930. One villager told it was vacated due to a massive influenza outbreak. Another, told us it was abandoned due to the risk of sink-holes which threatened to swallow the entire village at any moment. Babushka didn't say much about it when we'd ask. "It is dead." She would say. "Would it make it less-dead if you knew why?" It was easy enough to locate, the two villages had once been sister towns. There was still the rough outline of a country road which connected both locations. Easiest access was actually by horseback, which was its self a new experience for me. Ludya "drove" while I sat behind her. The journey was a bit slow going in the light fluffy snow, and we had to stop several times. Finally, around noon we came to the remains of a check-point. These cookie-cutter checkpoints were classic to the early Soviet Union, they provided a sort of guard post, and emergency stopping location in case travelers needed help along the road. They were painted bright blue and could hold a couple "Militziya" (soviet police) troops. Several of the old posts were still visible around other villages in the area, though they had been long abandoned. This one was little more than an outline, as the ceiling had obviously collapsed decades ago, allowing the wooden skeleton to rot and fail. The village itself was a ghost. You could make out where roads had been once, by the tree lines. There were a few twisted frames of what looked like horse-drawn wagons, or farm equipment. After 90 years, there wasn't much left that hadn't been claimed by the trees, or been blasted to dust by the harsh winters. The entire area was completely still, the only sound coming from the feet of our horse as we made our way through the frozen remains of the town. Around the corner from a massive live oak we found a stone house. Unlike the other wooden structures, which had all but been reclaimed by the forest, this building stood mostly intact. The front facing windows were lined in stained glass, which Ludya said meant it was most likely the country home of some aristocrat. Probably re-purposed after its former owner was arrested or shot in the Revolution. We stopped, dismounted and explored the exterior of the ruins. One of the outer walls had collapsed and gave us full access to the first floor. Looking upward, a flood of light filtered down through the rotted floorboards, nothing blocking it out as the roof was completely gone over the first room. The narrow rays of light played tricks in the shadows, making it look like the walls were moving, dancing as we passed by. As we walked through the main entry-hall Ludya took several steps up what remained of the stairwell and stopped. I was distracted looking at what appeared to be bullet holes in the plaster near the front door. Ludya called my name a few times before I finally heard her and passed back around to where she was standing. She was frozen in place, her foot actually hanging where it had stopped, as she had prepared to step up. 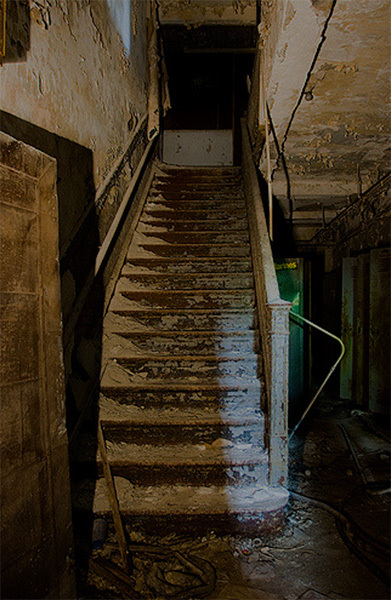 Her eyes were locked on a dark area, just through a crooked doorway at the top of the stairs. "Do you see it?" She asked me, in a whisper. "See what?" I asked her back. I stared up at the open doorway, straining my eyes to make out anything, but there was only blackness. "There's someone standing there, looking at us." She motioned with her hand as she said it. Moving closer to Ludya, I took a position directly next to her, standing on the same step... Nothing. I took another step up, the wood of the stairs was spongy and giving-way more than I liked. At about the fifth step, I stopped. I could see something - perhaps what she was talking about. It had shape, and it was roughly the size and outline of a man. The edges weren't clear, so it was hard to make out an exact size or the dimensions. The form was a dark smokey gray against the black of the hallway behind it. It definitely appeared to be watching us. Standing, or "floating" or whatever you'd call it, just at the top of the steps. I stood there dumbfounded, I had never seen anything like that before. My mind churned over the possibilities, but I was aware of a nagging fear as well. Something told me I should leave, but I couldn't turn my attention away. Ludya called out to the figure from behind me, asking who or what it was... The sound of her voice is what it took to snap me back from my transfixed stare. Backing down the stairs, I took her hand and directed her a few steps back toward our entry point. "Nezvan-ye gosti," she said to us... "Even ghosts hate uninvited guests." There are ways of finding out, the Soviet Union kept insanely meticulous records. But, that would mean going through the Krai's archives, mountains and mountains of moldy old boxes. LuciaJacint - Thank you for your comments, very kind! We were on horseback. The "road" was way too overgrown for anything except maybe an ATV. As I said above, it would probably be possible to find out more about the house, but the search is probably not worth the work. I mean a LOT of work. There are many reasons for the bullet holes. It probably belonged to an aristocrat. The far eastern part of Russia stayed out of Communist hands into the 1920's thanks to the US, UK and Japan sending in troops to fight the communists. When they finally did take control, a lot of the aristocrats were rounded up and shot. Or, it could have happened during the Soviet era, the government could round people up for any number of reasons. One way or the other, the house has probably seen a very long, sad, disturbing history come to pass. At least now it's mostly burned down and can finally decay away. Dreyk, this is sooo spooky. It would be interesting if you found out why that village was actually abandoned. Even it was due to economic reasons or all of the above. My younger sister just told me of a rather similar experience. I'll share it with YGS as soon as I get a chance. I absolutely love all your stories. The Russian backdrop is so ideal for a ghostly tale. Of course the horse ride in, was that a carriage or horse back? Made me think of some Russian novel where they might have lost their way and freeze to death or something. Is there anyway to find out more about that particular house? The bullet holes are intriguing? What happened there do you think? It dropped to 5C during the day (41F), and froze each night. Once the snows start, 41 isn't warm enough to melt snowfall from the night before. Plus there's also permafrost to contend with. Ludya's picture didn't catch the figure per se, but there is something up there, a fixture or window or something. Ludya thinks it's a door with a glass window, and that the figure was standing outside that door for some reason. I submitted the photo to be added to this story, but the backlog appears to be pretty long. We returned to the Dead Village once, a couple years later, but the entire area had been ravaged by forest fires. Nature's way of keeping things tidy. The house hadn't fared so well, but it did clear a lot of the over growth and made it easier to make out the original layout of the town. It was a huge place in its day. Beautifully written - ghosts of such a tragic time of upheaval. What it might have been like to have seen that house in its heyday. Too bad you weren't able to explore more though it was good of you to respect the peace of the resident spirits and going any further might have put you at risk of injury from the deteriorated structure. Perhaps, lady-glow, he meant that the days hovered in the 60s as a high, dropped to around 40 in the evening and froze over night (in the wee hours). Oops, sorry to switch to F there, its force of habit. Quite a story. Thanks for sharing. I guess Ludya did the right thing by trying to engage the "presence" with questions... Bold lady with good "presence of mind"; but you acted on the fear you felt and left. I guess fear is our warning mechanism; most of us instinctively take the fear we feel as a warning of danger. I guess the second floor was off limits. Did Ludya get anything out of the ordinary in the picture? © The ghost story Dead Village is copyrighted to Dreyk. Edited by yourghoststories.com.